This issue brief was prepared under contract between the U.S. Department of Health and Human Services, Office of the Assistant Secretary for Planning and Evaluation, Office of Disability, Aging and Long-Term Care Policy (DALTCP) and Thomson Health Care. For additional information about this subject, you can visit the DALTCP home page at http://aspe.hhs.gov/_/office_specific/daltcp.cfm or contact the ASPE Project Officer, Hunter McKay, at HHS/ASPE/DALTCP, Room 424E, H.H. Humphrey Building, 200 Independence Avenue, S.W., Washington, D.C. 20201, Hunter.McKay@hhs.gov. This issue brief--written by Paul Saucier, Jessica Kasten and Brian Burwell--is the first of three commissioned by the Department of Health and Human Services, Office of the Assistant Secretary for Planning and Evaluation on the federal Medicare Special Needs Plans (SNPs) authority. This brief focuses on an in-depth look at five SNP-State contracts. The remaining briefs address: SNP provisions impacting Medicaid programs, and the nature and extent of SNP-State contracting in 2008. Because dual eligibles receive health care and long-term services benefits under two entirely different public insurance programs and through two largely different care systems, it has long been recognized that services for dual eligibles are fragmented and inefficient. Consequently, increased attention is being placed on the development of care management models that can potentially manage the full spectrum of Medicare and Medicaid benefits for dual eligibiles in a manner that both improves consumer outcomes and reduces public costs. Initially, SNPs were encouraged by the Centers for Medicare and Medicaid Services (CMS) to coordinate Medicare-covered services with whatever Medicaid benefits their members were also eligible to receive, but no formal coordination requirements existed. This changed under the Medicare Improvements for Patients and Providers Act (MIPPA) of 2008, in which Congress required dual eligible SNPs to have contracts with their state Medicaid programs that formally address coordination of Medicare and Medicaid benefits for their members. This paper is the third in a series sponsored by the U.S. Department of Health and Human Services (HHS) Office of the Assistant Secretary for Planning and Evaluation on SNPs and their relationship to Medicaid. In the second paper of the series, we identified all states which had some kind of contractual relationship with SNPs prior to MIPPA, and classified those relationships into broad categories.5 The purpose of this third paper is to examine in greater detail a select group of state contracts with SNPs to determine how states use contracts to achieve Medicaid policy goals and advance care integration for dually eligible beneficiaries. As the link between state Medicaid programs and Medicare SNPs evolves further under the requirements of MIPPA, states may benefit from an analysis of existing contracting practices. The previous paper in this series identified a wide range of agreements reflecting the unique purchasing strategies of state Medicaid programs. From the earlier analysis, five program contracts were selected for more in-depth analysis to identify how particular aspects of dual eligibility and managed long-term services are addressed across a diverse set of state programs. The five programs from which contracts were selected are summarized in Table 1. By design, the programs represent a broad range of state initiatives, from Minnesotas highly integrated Senior Health Options (MSHO) program to a new cost-sharing program in Texas, with three other programs falling in between. It should be noted that three states included in this analysis have more than one type of SNP-based program operating. Minnesota, New York and Texas all have other types of contracts that relate to other distinct program initiatives in those states. We have chosen to feature one contract from each of those states because it represents a point in a national continuum of SNP-state contracts. For each topic, we offer a summary of the range of content identified in contracts, illustrated with actual contract language. We added underscoring to highlight key phrases and excised passages to keep selections short, but otherwise the contract language is as it appears in actual SNP-state contracts. The purpose statement contained in each SNP-state contract provides a good indicator of how far the rest of the contract will go in specifying Medicaid services, their integration with Medicare services, care coordination, quality provisions, reporting requirements and a host of other items. As one would expect, states seeking full integration of Medicare and Medicaid services enter into the most comprehensive and specific contracts, and states seeking cost-sharing-only agreements the least. In the middle are states that have as their primary goal more effective delivery of Medicaid long-term services, and which enter into contracts with SNPs to allow for Medicare integration as a secondary benefit. Table 2 offers examples of the range of purpose statements found in SNP-state contracts. The Minnesota contract seeks a fully integrated, alternative delivery system for dual eligibles, a goal that manifests in a nearly 200 page contract plus appendices. The relatively modest goal of capitating cost-sharing in Texas requires much less oversight and is governed by a 20 page contract. Minnesota and New Mexico both mention long-term services in their purpose statements, and each contract goes on to include long-term services in its Medicaid capitation. In contrast, the Texas contract is not designed to address long-term services, and does not mention them. Minnesota and New Mexico differ in their primary objective. The MSHO programs reason for being is to integrate Medicare and Medicaid services. The Coordinated Long-Term Services (CoLTS) program seeks first and foremost to deliver long-term services more effectively. By requiring its contractors to be SNPs, New Mexico is encouraging contractors to integrate Medicare and Medicaid when possible, as a secondary benefit of the program. Table 3 illustrates the range of policy options available to a state and how they play out. New Yorks Medicaid Advantage Plus (MAP) contract includes two key enrollment policy decisions. First, the state opted to mirror Medicare enrollment policy. Enrollment is voluntary for both Medicare and Medicaid, with no lock-in period. Secondly, New York made an additional policy decision to underscore that the unique benefit of this program is Medicare-Medicaid integration. The state will only enroll a beneficiary for Medicaid services if the beneficiary has opted to enroll with the SNP for Medicare. In contrast, the New Mexico CoLTS contract establishes a mandatory Medicaid program with a 12-month lock-in period (with one switch allowed in the first 90 days). In CoLTS, Medicaid enrollment policy takes precedence, and because Medicare enrollment can never be mandatory, integrated care is available to a subset of members who choose to enroll for Medicare as well. In the New York contract, 100% of Medicaid members will be dually enrolled for Medicare as well, but the overall enrollment is likely to be relatively low. In New Mexico, the state achieves high Medicaid enrollment, but limited penetration of dual enrollment into both Medicaid and Medicare. Finally, the Minnesota contract offers a hybrid that reflects the states overall Medicaid managed care strategy. In Minnesota, the default option for older persons is the mandatory Senior Care Services program, a Medicaid-only program. MSHO is structured as a fully voluntary option for those who choose integrated care, and the state mirrors Medicare enrollment policy in that program. Those who do not choose MSHO are enrolled in the mandatory Senior Care Services program. Contracts also address a more technical enrollment issue. Two separate processes must take place to achieve dual Medicare and Medicaid enrollment. Beneficiaries must be enrolled into CMS MA system for Medicare, and into a states enrollment system for Medicaid. Alignment of enrollment dates is important for creating a seamless beneficiary experience and for paying plans appropriately. Table 4 shows how Minnesota and New York address coordination of Medicare and Medicaid enrollment. In MA, enrollment is effective on the first day of the month following approval of the beneficiarys enrollment. The Minnesota contract language mirrors the Medicare effective date for MSHO only. For those enrolled in the non-integrated Senior Care Services program, enrollment is effective on the first day of the second month following approval. But for purposes of achieving seamless, dual integration for MSHO members, the state opted to adapt its standard Medicaid enrollment policy to align it with Medicare policy. New Yorks language is slightly different, containing a two-part test. To be enrolled for Medicaid, a beneficiary must appear on the state enrollment roster and must be enrolled for Medicare. The language may or may not result in a unified Medicaid and Medicare enrollment date, since getting on the state enrollment roster generally takes longer than enrollment in Medicare, depending on when during the month the beneficiary has opted to enroll. It does ensure, however, that no one can be enrolled in MAP unless the person has enrolled for Medicare. This reinforces the states policy (illustrated in Table 3) that it will not enroll Medicaid beneficiaries unless they have also selected the plans Medicare product. Marketing is an important aspect of enrollment. Table 5 shows a range of contract approaches. Minnesota uses the contract to assert state review of all materials, including Medicare materials. The Idaho contract, on the other hand, limits the state role to reviewing Medicaid material, and defers to CMS on review of Medicare material. The Texas contract takes a different approach altogether by creating an incentive for plans to submit material to the state. Plans that submit comparison charts for state approval then have the advantage of having their product summarized on material provided by the state to dual eligibles. SNP-state contracts give states opportunity to regulate what materials are presented to dually eligible beneficiaries and reduce confusion in their markets. The opportunity for plans is to obtain endorsement and assistance from states in marketing to dually eligible beneficiaries. A broad range of Medicaid services are provided through SNPs under capitation. They are generally listed in contract appendices too long to reproduce here. Table 6 provides a summary. Not surprisingly, the Texas contract capitates cost-sharing only, since that is the purpose of the contract. On the other end of the spectrum, Minnesota includes virtually all Medicaid services in its capitation to SNPs, reflecting its policy goal of a fully integrated product. New Mexico also includes an extensive package of services in its capitation, with the exception of behavioral health services. That exclusion stems from the states earlier decision to deliver behavioral health services through a statewide behavioral health services organization. Idahos Benchmark program was designed with the states relatively healthy dual eligibles in mind, and therefore does not include long-term services. Regardless of whether services are included in a capitation or continue to be paid on a fee-for-service basis, most of the contracts recognize the overlap in Medicare and Medicaid benefits and define certain Medicaid benefits in relationship to Medicare. Table 7 offers examples. As long as Medicare and Medicaid funding continue to be accounted for separately (as they must be under current federal authority), the possibility of cost shifting exists, even in highly integrated programs like Minnesotas. The examples in Table 7 all seek to get expenditures allocated to the appropriate ledger. Even in the context of fully capitated payments, how an encounter is recorded will impact cost reporting, potentially affecting future rate setting. Of particular concern in several contracts is coordination of drug benefits, as the examples in Table 8 illustrate. This area has many coordination pitfalls, including: (1) most state Medicaid programs cover prescription drugs not covered by Medicare Part D; (2) Part D plans and state Medicaid programs have different drug formularies; and (3) Part D plans and state Medicaid programs have different pharmacy dispensing networks, and different dispensing fee arrangements with their networks. States also seek added value for dually eligible beneficiaries by creating contractual obligations for the plans to provide benefits that would not otherwise be provided by Medicaid. Minnesota specifically obtained elimination of Medicaid co-payments. New Mexico created a generic expectation, to be made specific by the contractor. All of the contracts included in this analysis include care coordination expectations. The way care coordination is described varies with the program model, as the examples in Table 10 illustrate. In MSHO, where virtually all Medicare and Medicaid services are the responsibility of the SNP, care coordination is defined very broadly to include all Medicare and Medicaid services. In the MSHO model, these are all within the control of the contractor, which receives comprehensive capitated payments for Medicare and Medicaid, including Medicaid long-term services. In contrast, Idahos Benchmark program includes few Medicaid services in its capitation to the SNP. Long-term services remain fee-for-service, and there is no payment to the plan for waiver services or other Medicaid-funded care coordination. The contract instead provides funding for primary care case management (PCCM), and makes the primary care providers responsible for coordination of Medicare and Medicaid benefits. This approach reflects the states expectation that few, if any, Benchmark Plan members use long-term services. Finally, the language contained in the Texas Cost-Sharing contract anticipates that coordination will be needed between the SNPs Medicare services and separately managed long-term services. (This contract capitates cost-sharing only, so long-term services, when needed, will be accessed on a fee-for-service basis or through Star+Plus plans, depending on the region.) Texas does not include any payment for care coordination in this contract, but creates a clear expectation that the SNP will provide it as needed to coordinate with Medicaid. Consumer participation in care planning is an important concept that has been emphasized increasingly in Medicaid home and community-based waiver and other long-term services programs. This emphasis is evident to varying degrees in SNP-state contracts that include long-term services, as shown in Table 11. Arguably, the New Mexico language goes the farthest to assert consumer control, and this may be related to the program design. The New Mexico program was designed as a mandatory Medicaid long-term services program, with Medicare integration as a secondary goal. The program includes younger persons with disabilities, who, in most states, advocate more forcefully for consumer control than older persons. SNP-state contracts have requirements related to the adequacy of SNP provider networks that go beyond federal MA requirements. Table 12 shows how this is approached in contracts with capitated Medicaid services (Minnesota and New York), and how Texas approaches the issue in its cost-sharing contract. By referencing all Covered Services and all of the benefits in Appendix K-1 and K-2, Minnesota and New York create broad adequacy expectations that apply to all of the Medicare and Medicaid services provided through those SNPs. In the Texas Cost-Sharing contract, the goal is better coordination between the SNPs Medicare services and Medicaid services that will be provided out-of-network. Rather than focusing on the network, the state has created a standard around notification. The SNP must have and notify its members and providers about Medicaid providers in the region. In addition to general adequacy standards, SNP-State contracts have provisions specific to long-term services. Table 13 shows a range of approaches to ensuring access to long-term services. New Mexico requires SNPs to train their network providers regarding the CoLTS program. Texas, which does not include long-term services in its cost-sharing contracts with SNPs, requires the SNPs to provide training to their Medicare network providers regarding Medicaid long-term services, making it more likely that the Medicare providers will know how and where to make long-term service referrals. Many traditional Medicaid long-term services are informal relative to Medicare services, and are not necessarily familiar to MA plans. Some long-term services advocates fear that the process of Medicaid-Medicare service integration will formalize and medicalize long-term services. Having specific contract provisions that describe long-term services and the qualifications of those who deliver them, and requiring training of the SNPs network providers, are ways of addressing these concerns. Most SNP-state contracts require submission of encounter data to the state, although the scope of encounters varies. Minnesota and New York both require all Medicare and Medicaid encounters to be submitted, while New Mexico requires only Medicaid encounters. This probably reflects the fact that New Mexico CoLTS is primarily a Medicaid long-term services programs, with only a small minority of members also enrolled in the SNPs Medicare products. The Texas Cost-Sharing contract calls for submission of Medicare encounters to the state, presumably so the state can assess the appropriateness of its cost-sharing capitation amount from year to year. Some states require SNPs to submit copies of information provided to CMS as part of the MA bid and cost reporting processes. Table 14 provides examples. In Minnesota, Medicare bid information is provided directly to the states actuaries. Some states also require functional data to be submitted, as shown in Table 15. Although none of these states presently use this functional data to adjust payments for risk, they may be using the information to compare their SNP-based programs with other programs, including fee-for-service. They may also be using the data to develop and test risk adjustment methods for future application. States also require SNPs to submit a range of performance data. These are addressed in the next section. State contracts tend to build on the Medicare quality requirements that SNPs are already required to follow. Typically, the state contract calls for SNPs to submit copies of whatever quality data they are providing to CMS, which often includes Medicare Health Plan Employer Data and Information Set (HEDIS) data, Consumer Assessment of Health Providers and Systems (CAHPS) survey data and the Health Outcome Survey (HOS). Table 16 offers examples. States appear to be balancing a desire to integrate and streamline quality reporting with a need to collect data that is specifically relevant to dual eligibles. Minnesota, for instance, allows SNPs to use Medicare Performance Improvement Projects (PIPs) to meet Medicaid requirements, but only if the PIPs are approved by the state as being applicable to its population. New Mexico specifies that the states Medicaid version of CAHPS must be used, and duals must be included in the survey. States also supplement Medicare quality requirements with provisions addressing care coordination and long-term services. Table 17 offers examples. Table 18 illustrates how the primary orientation of a program influences contract language on grievances and appeals. The Minnesota contract, with its emphasis on dual eligibility, recognizes both Medicare and Medicaid processes in its SNP contract, making clear that beneficiaries have access to either or both. New Mexico specifies a Medicaid grievance system without mention of Medicare, again reflecting that the CoLTS program is primarily a mandatory Medicaid managed care program with a minority of members dually enrolled for Medicare. At least two of the contracts contain provisions for special financial incentives. The Minnesota contract specifies two areas, dental access and geriatric evaluation, where plans are required to participate by passing on special incentive payments to providers. The New Mexico contract allows the state to provide incentives for exceptional performance, but does not target particular areas. SNPs were initially authorized by Congress as specialty MA plans with a focus on improving care for vulnerable subsets of Medicare beneficiaries, including persons dually eligible for Medicare and Medicaid. In the early years of the program, Dual Eligible SNPs proliferated, yet only a small minority had formal contracts with state Medicaid programs. In amending the program to require SNP-state contracts, Congress expressed clearly an expectation that Dual Eligible SNPs actively coordinate Medicare and Medicaid services. Although the requirement currently applies only to new SNPs and expanding SNPs, Congress seems poised to raise the bar for all SNPs. At least one health reform bill (Senate Bill 1796) would require all Dual Eligible SNPs to hold both Medicare and Medicaid contracts for their members by January 1, 2013. Congress and CMS continue to refine the policy objectives of the SNP program, largely from the perspective of the nationally uniform Medicare program. (SNPs are, first and foremost, MA plans.) The contracts in this analysis, however, demonstrate that states engage with SNPs to achieve a broad range of Medicaid policy goals. As Congress continues to work on improving the SNP program, its challenge is to set standards while allowing sufficient flexibility to make Dual Eligible SNPs effective partners in meeting a broad range of state Medicaid program goals. The authors would like to thank the following state program officials for their assistance in obtaining contracts and providing important contextual information that facilitated our study: Pam Coleman (Texas) Linda Gowdy (New York), Larry Heyeck (New Mexico), Pam Parker (Minnesota), and Sheila Pugatch (Idaho). Agreement Between the New Mexico Human Services Department, the New Mexico Aging and Long-Term Services Department, and Coordinated Long-Term Services Program Contractors. 2008. Agreement Between Texas Health and Human Services Commission and Medicare Advantage Dual Eligible Special Needs Plan [for cost-sharing obligations]. 2009. Idaho PAHP Provider Services Contract for Medicare/Medicaid Coordinated Care. 2008. Minnesota Department of Human Services Contract for Minnesota Senior Health Options and Minnesota Senior Care Services. 2008. New York Medicaid Advantage Plus (MAP) Model Contract. 2007. Approach to Medicare Limited Medicaid wrap-around for dual eligibles who have chosen the SNP for Medicare. Medicaid and Medicare are integrated by design. All members are dually enrolled for both. Primarily a Medicaid managed long-term services program. CoLTS contractors maintain SNP status for dually eligible members who may choose to enroll for Medicare as well. Substantial Medicaid wrap-around for dual eligible members who have chosen the SNP for Medicare. Capitated cost-sharing-only for SNPs that choose to contract with the state. Medicaid services remain fee-for-services. * They receive cost-sharing benefits from Medicaid via a capitated payment contract, but are not enrolled for Medicaid services. Texas Cost-Sharing Medicare cost-sharing obligations. Idaho Medicare-Medicaid Coordinated Benchmark Benefit Plan Medicare cost-sharing obligations. Prescription drugs not covered by Medicare. Certain other primary services, including PCCM. New York MAP Medicare cost-sharing obligations. Certain other primary services. Certain therapies. Most long-term services. * Behavioral health services. New Mexico CoLTS Medicare cost-sharing obligations. Prescription drugs not covered by Medicare. Primary services. Acute services. Long-term services, including waiver services. MSHO Medicare cost-sharing obligations. Prescription drugs not covered by Medicare. Primary services. Acute services. Long-term services, including waiver services. Behavioral health services. * New York MAP includes several home and community-based services waiver-like services (e.g., adult day services) but the states 1915(c) waiver program is not incorporated into MAP. Therapy services, including physical therapy, occupational therapy, speech therapy and respiratory therapy, for medical assistance, up to the limits established in Minnesota Statutes, §256.0653 and Minnesota Rules, Part 9505.0390 and for MSHO, for Medicare, so long as the enrollee meets Medicare criteria. (Section 6) Medicaid services after MA plan services are exhausted. Once the following MA plan services are exhausted under contractors Advantage Plan, the Department will cover the service. Inpatient hospital care after an Enrollee has exhausted their benefit limitper eligibility period or the lifetime reserve of days. The MCO has chosen to waive Medicaid co-pays for MSHO community enrollees for the term of this contract. The MCO shall have a uniform policy to assure that the same amounts of co-pays for the same types of services are waived for all MSHO community enrollees. (Section 4.16) The contractor shall provide a schedule for implementing value added benefits/services pursuant to the contractors proposal, such as a transitional benefit, and approved by the state. reported to the state in a format and frequency determined by the state. the care coordinator works in partnership with the enrollee and/or authorized family members or guardians and primary care physician. The MCO shall provide care to enrollees through the use of an adequate number of hospitals, nursing facilities, service locations, service sites, and professional, allied and paramedical personnel for the provision of all covered services, pursuant to the following standards. (Section 6.10) The contractor agrees to provide enrollees access to MA benefit package and MAP benefit package services as described in Appendix K-1 and K-2 of this agreement in a manner consistent with professionally recognized standards of health care and access standards required by applicable federal and state law. (Section 15) The MA dual SNP must notify dual eligible members and other dual SNP members, via member communication materials, that information concerning Medicaid provider participation is available on the MA dual SNPs and the states websites, and that dual eligible members may request written copies of Medicaid provider directories by contacting the Texas Medicaid enrollment broker. The minimum age of a PCA is 18 years. The provider must be a PCA employed by or under contract with a personal care provider. Supervision of PCA is provided by a registered nurse. personal care provider organizations must meet the standards under Minnesota rules, Part 9505.0335. Health Outcomes Survey-Modified (HOS-M) (PACE) Health Survey. The MCO SNP will share HOS-M survey results with the state within 30 days of receiving the results. (Section 3.5)The MCO agrees to operate ongoing PIPs that incorporate the standards and guidelines outlined by CMS with modifications as defined by the state. Medicare Payment Advisory Commission, "Dual-eligible Beneficiaries." In A Data Book: Healthcare Spending and the Medicare Program, June 2009. Kaiser Commission on Medicaid and the Uninsured. Dual Eligibles: Medicaid's Role for Low-Income Medicare Beneficiaries, February 2009. CMS. Special Needs Plan Comprehensive Report--September 2009. In total, there are about 8.8 million dual eligibles nationwide, so about 12% of all duals were enrolled in SNPs in September 2009. Ibid. See also Grabowski, D. (2009). Special Needs Plans and the Coordination of Benefits and Services for Dual Eligibles. Health Affairs 28(1):136-146, and Saucier, P., and Burwell, B. (2007). 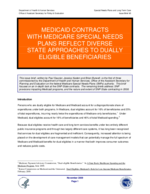 Impact of Medicare Special Needs Plans on State Procurement Strategies for Dually Eligible Beneficiaries in Long-Term Care. Prepared for CMS.